Here are some examples of the correct (professional) way to treat antique hairpins in our museum. We show the best way to clean old objects and how to pack things in the correct way so that they are protected and preserved for the future. We also show some case histories where we restore and conserve some hairpins with problems. 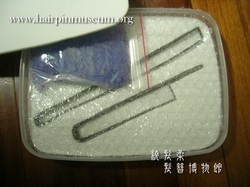 If you have any old hairpins which are "sick" or "broken" you are very welcome to contact the Hairpin Museum for advice or practical assistance from out team of professionals.